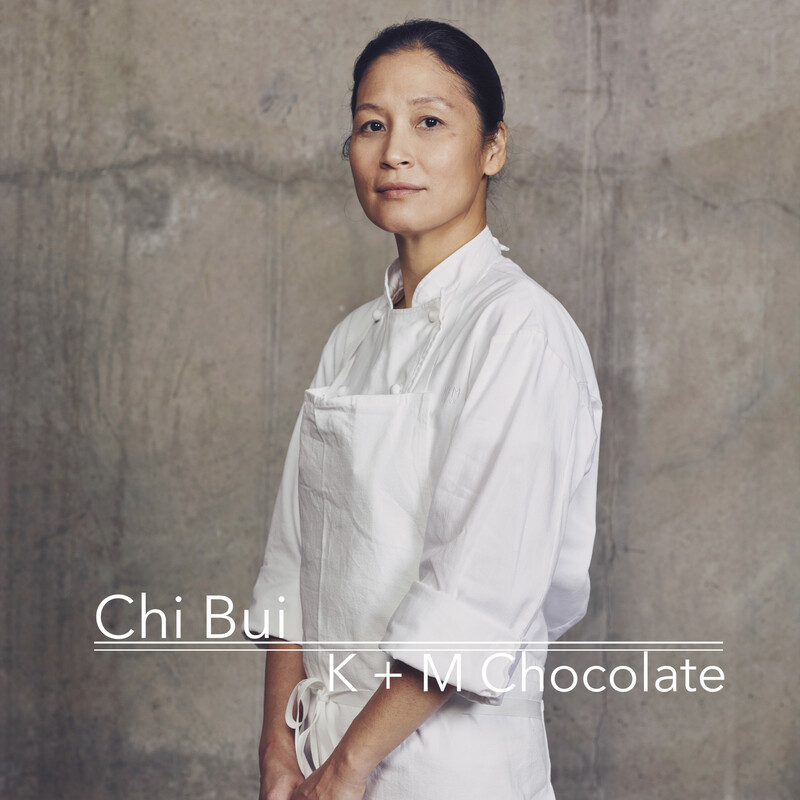 Chi Bui led many lives before her current one in chocolate. Her well-to-do Vietnamese family fled their home city of Hue after the war; her parents lost everything immigrating to the U.S., but ultimately resettled her and her five siblings in Philadelphia. Chi’s mother ran a food truck for 20 years, a feat of labor and love from where Chi learned preserverance and leading by example. She went on to major in literature at the New School while fixing computers part-time — which serendipitously led her to working at the United Nations, leading efforts to install the first WiFi ports in countries like Pakistan and Bolivia. After 10 years, she decided to take time off to raise her two children; just like her own mother, she learned to cook as a requirement to feed her family. Her interest was piqued and Chi decided to go back to school in Pastry Arts as a way to challenge herself. There, she fell in love with chocolate. Now, she’s combined her past experience in global development with her relentlessly curious, research-oriented mindset to deconstruct the chocolate-making process, starting with its supply chain. Join us as we talk through Chi’s inspiring journey, why chocolate finished with extra-virgin olive oil is the perfect match and what changes she hopes to see in the international cacao trade. cacao Chi Bui chocolate culinary school Ethan Frisch extra virgin olive oil Jenny Dorsey pastry supply chain trade Why Food?